So I have looked at replacement parts for my bike, and a potential successor, so now I have to decide which way to go. If I upgrade the parts on my bike I get to keep it’s great steel frame and setup. If I go with the new bike I get all parts replaced and a more modern ride. I’m going with the upgrades! I’ll be honest, I still love the old Kona, and there is nothing like it out there. That’s not to say what’s out there isn’t as good, but so far, I still prefer my bike. I’m doing the upgrades bit at a time, starting with the SLX drivetrain, which I ordered from Merlin Cycles. 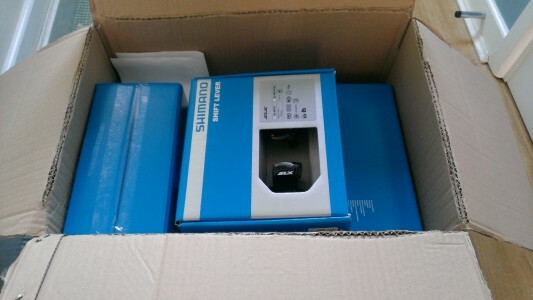 I’ve actually order the full groupset and am selling the brakes on. That way I get the 2 x 10 setup that seems the optimum for slightly less than the cost of the 3 x 10. The only downside to this is that I have to remember how to fit it all, and it’s been a long time since I did maintenance – that might be another post if it doesn’t go well!